On October 3 Bishop Tikhon (Shevkunov) of Yegoryevsk, Vicar of the Patriarch of Moscow and All Russia, met with the President of the Republic of Macedonia Gjorge Ivanov, reports the Makfax independent Macedonian news agency. During the meeting they exchanged views on the present state of relations between the Macedonian Orthodox Church which is unrecognized by the Orthodox world and the Russian Orthodox Church. 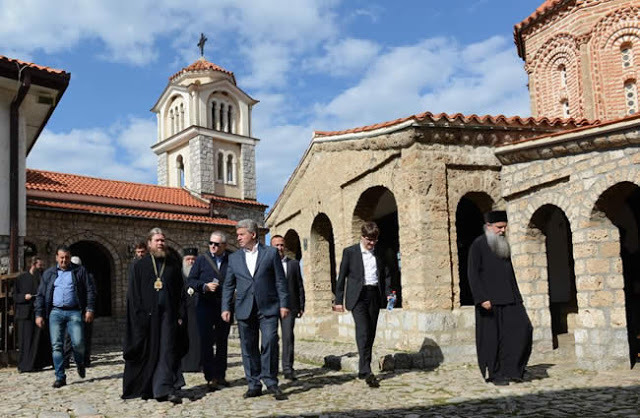 Gjorge Ivanov stressed the need for further intensification and development of relations between the Russian and Macedonian Churches and of those of the Russian and Macedonian peoples in general. 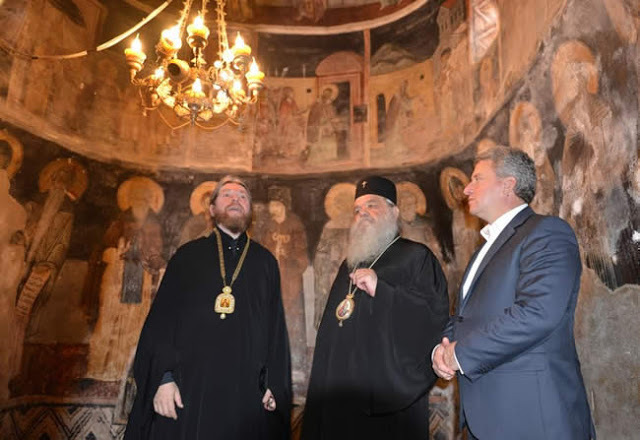 In the course of the meeting Bishop Tikhon conveyed the greetings of Patriarch Kirill of Moscow and All Russia to Gjorge Ivanov and noted the contribution of Ohrid and Macedonia to the spreading of Orthodox Christianity. Bishop Tikhon is currently on a two-day visit to Macedonia to participate in the launch of the Macedonian edition of his book, Everyday Saints and Other Stories. Macedonia’s Health Ministry Commission for Infectious Diseases declared on Tuesday a measles epidemic on the whole territory of the country. According to Vladimir Mikikj, an epidemiologist with the Commission, the decision was made in order to control and prevent the further spread of measles, decrease the number of new infections and also prevent severe forms of this disease. Talking about some of the new measures, Mikikj said, unvaccinated children would not be admitted to kindergartens, and the vaccination age is to be lowered from 12 to 6 months. “At the moment, more than 70 children are hospitalized and seven are in critical condition,” said Mikikj, adding that hospital visits are banned to prevent new infections in hospital conditions. Since the onset of the epidemic in the capital Skopje in December 2018, a total of 961 measles cases have been registered in Macedonia. Musical instruments, folklore costumes, uniforms, jewelry and various items and sundries which date back more than 100 years are arranged on the shelves in antique shops in the Old Bazaar, which are some kind of time machines that will take you on a journey in the 19th century through the days of the former Yugoslavia, until the independence of Macedonia. Antique shops in the Skopje Bazaar, despite for collectors of antiquities, are as well very attractive for tourists who mostly buy traditional Macedonian costumes. But part of the owners of antiques complained that people come in their shop just to take a look at the objects and they joke that they will earn more if they collect money for the entrance. The purchase price of first-class lamb to traditional Italian market ranges between MKD 135 to MKD 140 for Easter holidays, sheep breeders said. Sheep breeders are not satisfied either with the price or the product placement. They expect export to reach a maximum to 150.000 heads of sheep which is a decrease compared to last year when it reached 200.000. “Macedonian lamb is traditionally exported in Italy as well as in Croatia. We also know that there are demands for lamb in Turkey. The price is low which cannot cover production costs. We believe that two factors influence the product placement-the Easter is nearing and the lambs are not grown up for sale. Also the number of sheep stagnates it does not increase. The shepherds work is very expensive and there are no people who would like to work this job,” President of Sheep Breeders Association ‘Dashi’ from Debar, Skender Ame said. NYSK Holdings is a pharmaceutical company implementing cutting-edge technology and well-established scientific methods to develop safe, effective, and targeted cannabis products. NYSK Holdings operates from a state-of-the-art GMP certified facility located in the Republic of Macedonia. The facility grows and extracts medical-grade cannabis products. Our team consists of agronomists, botanists, and experts in the cannabis industry. NYSK’s philosophy is to create top of the line, innovative, and effective THC- and CBD-based medications. Macedonian phalanx closed central Sydney streets! The protest march, which was successfully organized by all the Macedonian social, cultural, social and church associations, began before the Sydney Town Hall and flowed through the central Sydney streets, to Martin Place, where the main, official event took place. On this grand event, the Australian anthem sang Milica Kiprovska, the Macedonian anthem was sung by Blagojce Petrov, and the Aboriginal blessing for holding the event on the Australian soil was given by the Macedonian son-in-law, the Aboriginist Brett Grogan. Before the audience spoke: Joshua Sherman, Zaklina Mihajlova, Igor Markovski, Dushan Risteski and Chris Karanfilovski. The address highlighted that MACEDONIAN BASIC HUMAN RIGHTS ARE TAKEN. It should not and must not the world to shut the eyes before the genocide against the Macedonian people that has been in existence since 1912 to this day! Christopher Purdef, an orthodox deacon from the US state of Ohio, posted on Twitter a map of former Yugoslavia in the mid-1970s, which says Macedonia about the then southernmost republic. “As I was saying, Greece didn’t have a problem with Macedonia in the 70’s”, he wrote. A little later Purdeff gave a new argument about the Greek attitude towards the identity of its northern neighbor from four decades ago – an excerpt from a book in which the languages of the then SFRY, including the Macedonian, were listed in Greek. The City of Skopje has paid the subsidies for purchasing a pellet furnace in 2016. A total of 196 citizens met the criteria envisaged in the subsidy programme according to principle “first-come, first-served”. The public call for subsidies was released on October 12 and closed on November 4, including 343 applications. “All applications were reviewed, with 196 accepted as meeting the requirements, whereas others either did not fulfill the criteria or were filed after the programme funds were exhausted”, said the City of Skopje. The call was issued in order to stimulate citizens in using renewable energy sources as heating in their homes. The funds amounted to 70 percent of the pellet furnace price, but not exceeding MKD 30,000 (EUR 500). The total budget of the subsidy programme amounted to MKD 5,9 million (EUR 95,000). Macedonia will mark Tose Proeski's birthday with a blood drives in Krushevo and the Army Hall in Skopje, exhibition of photographs and promotion of a new version of one of his songs. The singing legend who died in a tragic car crash in 2007 was born on this day in 1981 and would have been 36 today. The blood drive in Krushevo will be held in the Memorial House bulit in his honor and citizens can donate blood during the entire day. At noon, at the exhibition area in the Memorial House, 15 photographs of Toshe which haven't been shown in public before, will be put on exhibition. An instrumental version of his song "Nikada" will also be promoted. Fans from across the Balkans, and even Russia, are in Krushevo to honor the singer and humanitarian. Denmark has stated it is not ready at EU’s June summit to support the proposal of the European Commission to start membership negotiations for Macedonia and Albania. “No, I can say with certainty I will not support that initiative. We should be honest about that issue,” said Danish Prime Minister Lars Rasmussen after EU’s summit in Sofia. According to him, the EU should not repeat the previous mistakes, citing the decision to start negotiations with Turkey as a grave error. With this attitude, Denmark virtually joined France and the Netherlands, who also expressed serious stocks. To Denmark, it doesn’t matter whether Macedonia changes its name, it has nothing to do with Copenhagen decision to block future EU enlargement. At the moment, the official candidates for EU membership are Albania, Macedonia, Serbia, Montenegro and Turkey, of which the last three have started the negotiations – Montenegro in 2012, Serbia two years later, Turkey in 2005, but in 2016 were suspended.